The Philippines, a country that is comprised of over 7,100 islands, so traveling between points becomes a relevant factor when going to the different locations within the archipelago. There are various means of transport options available to help you get to where you need to go and some of these are common and others unique only to the Philippines. The main international gateways to the Philippine Islands are Manila, Cebu, Clark, Davao, Laoag and Subic, and all international flights diverge to any of these cities with the Ninoy Aquino International Airport (NAIA) located in Manila being the primary gateway. This airport is served by over 30 international airlines which fly to and from different cities around the world. In Cebu the Mactan International Airport (MIA) handles regular international flights from Australia, Japan and Singapore in addition to chartered flights from countries like Japan and other major countries. The Francisco Bangoy International Airport located in the south of the Philippines handles flights for Indonesia, Malaysia and Singapore. In Central Luzon, the Clark International Airport in Pampanga and Subic Airfield in Zambales service both chartered filghts and cargo planes. To the north of the country, the Laoag International Airport in Ilocos Norte handles regular flights from both Taiwan and Macau. The country’s national carrier is Philippine Airlines (PAL) considered as “Asia’s First Airline”, and to this day remains as the biggest airline company in Philippines, with the largest number of international and domestic flights. 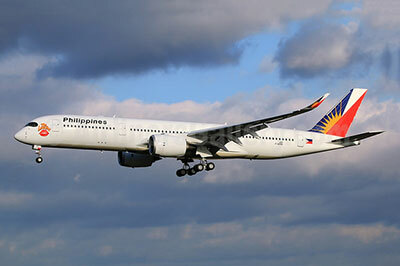 PAL has routes to over major 14 cities in 8 countries and regularly flies to 41 Philippine destinations outside Manila. The Philippine Islands being an archipelago of thousands of islands separated by bodies of water, travel by sea is an integral part of the transportation system. A wide range of sea faring options are available which include small ferries to huge cargo vessels, and liners. From the major port of Manila you can take sea trips that can last for a day or two with any of the regular ship lines that ply the sea routes or perhaps take shorter trips with the larger ferries. For further distance inter-island travel the ferries of major Philippine shipping companies such as WG&A are most ideal and these ferries most often include first class cabins. If it’s a short island hopping transport you need over the seas, then there are the small motorized boats called banka’s which you can avail of to take you between nearby islands and islets. Traveling to the different islands of Philippines is indeed quite easy with all the options of sea travel available. Even in a country with over 7000 islands, moving around by land is easy with the Philippines national highways connecting major islands and the availability of an extensive public transportation system which includes the Jeepney, an exotic form of transportation unique to the Philippines. Other forms of land transportation include the trains, buses, taxis and trikes which make up the main modes of public transportation. In most towns and cities, the calesa, which is a horse powered carriage, provides a more elegant form of traveling but is more commonly used for tourist rides in parks across the nation. For long distance land travel a rail system locally called Metrotren and run by the Philippine National Railways is [spin]used|ideal[spin]. The route goes as far south as Carmona in Cavite and up north to Mecauayan in Bulacan. The rail system within Metro Manila composes of the Light Rail Transit (LRT), which plies the routes from Caloocan to Baclaran, Pasay City and the Metro Rail Transit which traverses the whole length of the EDSA (Metro Manila’s main highway) and also connects North Avenue in Quezon City to Taft Avenue in Pasay City. The MRT passes through all major arteries of Metro Manila including Makati’s financial district. The best way to get around is using the taxis and they travel any routes throughout Metro Manila. The taxis are also a cheap form of travel with a Flag down fare of 20 Pesos (approximately 30 US cents) on the meter. There are also the buses that ply the main roads of cities in Metro Manila in addition to the provincial buses that travel to various tourist spots throughout the country. For short distances you can make use of the trike, with a motorized version locally called a tricycle, or the human powered version of the trike called the pedicab. 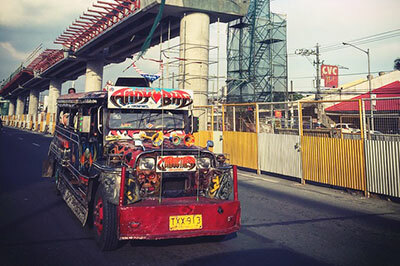 Being the Philippines, the undisputed “King of the Road” is the Jeepney, which has become the most seen fixture on the roads throughout the whole nation. The Jeepney is the Philippines’ version of American jeep which first emerged in the country after the Japanese occupation and has today become a symbol of national pride. Any Jeepney you will see is covered with colorful designs, with each design or theme different from the other, and uniquely Filipino. These are the best methods to travel around the islands of the Philippines, so when making your plans to travel travel to the islands you can take these tips in mind.